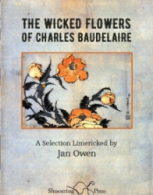 Jan Owen is a serious writer who has already translated Baudelaire’s Selected Poems (Arc Publications, 2015). It is important to say this, because she says herself that her little book is a ‘descent from the sublime to the ridiculous’. It comprises eighty-seven limericks, loosely related to poems from Les Fleurs du Mal, and we all know that it’s almost impossible for a limerick to sound serious. This Baudelaire is not the tormented soul that his biographer Enid Starkie insists he was but a total hedonist, forever drunk or falling in and out of bed. Which means that a great part – perhaps the most important part – of his poetry is lost in translation. is mocked! His giant wings won’t let him walk. Full of beer, we are bloody sublime. Is not picturesque. Try Tibet. You have spurred me to write even better.